Live video streaming on cloud-based delivery network promises to meet viewer expectations to watch content anywhere on any device. Video OTT cloud networks adds new complexities and visibility challenges, requiring cloud based monitoring to assure the high quality delivery. One of the biggest problems of the switch to OTT content is the need to ensure content coming in from multiple sources is encoded properly. Live cloud OTT workflows delivery to individual devices with multiple profiles, is a dramatic increase in complexity over one-size-fits-all traditional TV. 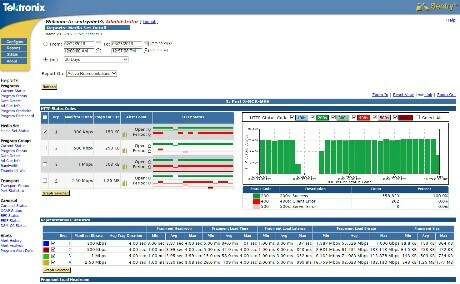 This means checking for issues like over compression, misalignment of frames, syntax issues, dropped packets, lost markers and metadata, and compliance issues, all of which can lead to poor customer experience and high customer churn. Tektronix addresses this problem by looking at the quality of content end-to-end through the video workflow, and scaling it to 1,000s of programs, allowing you to log, raise alarms, report on status, and notify of issues anywhere in the end-to-end system. This helps resolve issues quickly, before customers get impacted. Correlate Information Across Multiple Points & Networks. In OTT delivery, another issue that must be addressed is to make sure that all the assets in all the profiles are available in the expected format, with the quality necessary to be delivered to the end customer. 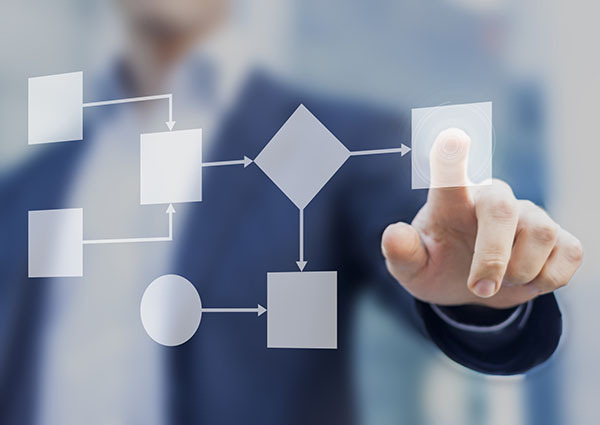 This involves validation of the asset in different profiles, which can be difficult if you don’t have the tools to determine where problems are occurring within the workflow. Tektronix offers proactive automated monitoring of all assets, in all formats, in real time, and logs a history of events. This solution can be deployed at any point in your workflow to pinpoint problem areas for a quicker mean time to resolution. It can also be consolidated into one view, so that when you see a problem, you can isolate exactly where it went wrong. 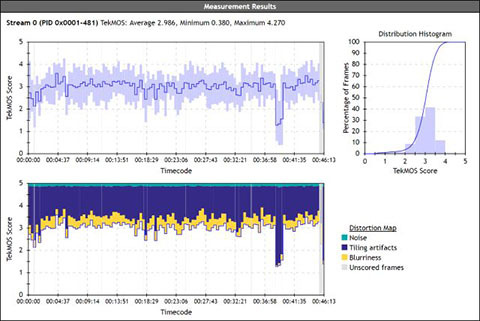 Unique to Tektronix, the non-reference TekMOS measurement can help you quickly identify content that fails to meet your threshold for acceptable video quality. Another problem in content streaming and OTT delivery stems from the fact that content is encrypted with DRM. Without being able to verify that customers are actually getting the quality of content they expect, it is impossible for providers to take corrective measures and maintain customer satisfaction. This leaves the door open for customer churn and lack of compliance reporting. Tektronix addresses this issue by monitoring assets as they leave the packager, as well as checking the content as it’s delivered to and from the cloud across multiple CDNs. This allows providers to maintain a consistent viewing experience regardless of location, ensuring customer satisfaction and industry compliance. Let us empower you and your team to address new techniques for Over-the-Top (OTT), TV Everywhere, and multi-screen delivery with this technical white paper. The quality of the content you deliver defines your brand whether it is streamed or broadcasted to your viewers. 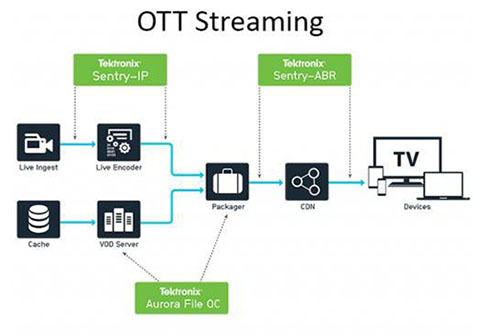 Sentry has been deployed worldwide by Cable, Broadcast and OTT Streaming service providers for use in operational, engineering and business environments. Aurora is an automated, scalable file-based QC system that saves media providers time and money by driving efficiency, quality, and cost savings in their workflows. Aurora can be integrated with external workflow management tools in both on-premise and cloud deployments to check thousands of hours of content continuously with unattended operation.